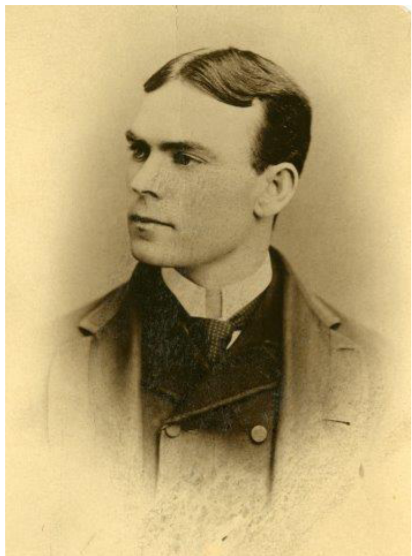 Larry Corcoran was a dominant pitcher in the early 1880s despite a less-than-intimidating 5-foot-3, 127-pound frame that gave him the nickname “Little Corcoran.” One of baseball’s early curveball masters, Corcoran was a part of three pennant-winning Chicago teams. He was a true workhorse, averaging 456 innings pitched and 34 wins per season for five years, until his arm, understandably, burned out. Unable to adjust to life outside of baseball, he turned to alcohol and died at the age of 32. Lawrence J. “Larry” Corcoran was born on August 10, 1859 in Brooklyn, New York, to William and Ann (Boylan) Corcoran, Irish immigrants. According to the 1860 US Census, William worked as a butcher. Lawrence was listed as a 19-year-old “ballplayer.” He had six siblings: older brothers William and Michael, younger sisters Frances, Margaret, and Mary, and a younger brother, Thomas. The Tribune called the White Stockings-Providence Grays game on June 4 “the most extraordinary game of ball ever played.” Corcoran and John Montgomery Ward of Providence pitched all 16 innings before the game was ended by darkness with the teams tied, 1-1.18 On August 5 Corcoran threw a two-hitter against Boston, outdueling Tommy Bond.19 On August 10 he pitched a one-hitter against Providence. The Tribune said, “(T)he heavy hitters of the visiting team were completely baffled by Corcoran’s slow and swift curves.”20 The win put Chicago in first place by 12½ games over the Grays. On August 19, in the days before the phrase “no-hitter” was used, Corcoran defeated the Boston Red Stockings who, as the Tribune put it, “obtained neither a tally nor a base-hit,” adding, “Corcoran was never in such form before, and Flint caught him superbly.” A rain delay in the third inning made the ball “mushy and shapeless for the greater part of the play,” but Chicago, the Tribune added, had 13 hits.21 Corcoran finished the season 43-14 with a 1.95 ERA. His 268 strikeouts, 4.5 strikeouts per nine innings, and 99 walks (the fewest) led the league. Goldsmith was 21-3 with a 1.75 ERA, and Chicago easily won the pennant. Corcoran and Goldsmith again formed a two-man starting rotation in 1881. Corcoran shut out Cleveland on May 3, allowing only three hits, and pitched a three-hitter against Providence on June 24.22 On August 4 he pitched a two-hitter against Buffalo in what the Tribune called “perhaps the best game of all his life,” adding, “His headwork and his consummate control of the ball he never abated for an instant.”23 Corcoran pitched a four-hit, 5-1 victory over Buffalo on August 17. Corcoran and Goldsmith were said to be trying a “snake ball” as their curves were dominating the league.24 On August 23 Goldsmith sprained an ankle in the third inning, so Corcoran came “in from the turnstile” and pitched the rest of the game with Chicago defeating Detroit in the 12th inning.25 The White Stockings easily won the pennant again, and Corcoran was 31-14 with a 2.31 ERA in 396⅔ innings pitched. His 31 victories tied Boston’s Jim “Grasshopper” Whitney for the league lead, but Whitney lost 33 games. Chicago struggled in the early part of the 1882 season, falling to 12-14 and fifth place on June 15. Corcoran hit a grand slam on June 20 against Worcester, “a tremendous drive to the seats in centre field,” according to the Tribune, and driving in seven of the 13 runs Chicago scored.26 Then the White Stockings got hot, going 21-6, and at the end of July were 33-20. Chicago scored six or more runs in 23 of Corcoran’s 40 starts.27 Corcoran won 10 consecutive starts from June 29 to July 29, including wins of 23-4, 35-4, and 17-1. At the end of August, Chicago trailed first-place Providence by 2½ games, and then went on a 16-2 streak. Corcoran again won 10 straight starts, including his second no-hitter, against Worcester on August 20. The day was “raw and disagreeable” with 1,500 spectators, wrote the Tribune, and “play began at 3:30 sharp in order to enable the Worcesters to take an early train for the East.” The 90-minute, 5-0 win showed that Corcoran “has been pitching a great game of late — perhaps the best of his life.”31 Corcoran finished the season 27-12 with a league-best 1.95 ERA in 355⅔ innings pitched, and Chicago won its third straight pennant, by three games over Providence. Chicago won 11 in a row from August 22 to September 8, including 10 straight home victories, and moved into first place 1½ games over Boston.34 Then the White Stockings traveled to Boston for a four-game series. They dropped the first game. The next day Corcoran pitched hitless ball through four innings in a duel with Jim Whitney. Two runs in the ninth inning gave the Beaneaters the 3-2 win and sole possession of first place, a lead they did not relinquish as they won the pennant.35 Corcoran finished 34-20 with a 2.49 ERA in 473⅔ innings pitched. This was the first year in which he did not league the league in wins, ERA, or strikeouts. But Corcoran wrote to team president Albert Spalding that he was withdrawing his request and had signed with the Chicago team in the new Union Association. The National League expelled Corcoran.38 The New York Clipper published a letter from Corcoran explaining his actions. He wrote, “I asked the large salary not because I thought I would get it, but in hopes of inducing the management to give me my release. After a short consideration Mr. Spalding informed me he would pay me no such exorbitant salary, and, as we could not come to satisfactory terms, I started for my home without signing.” Corcoran entertained an offer from the Chicago Unions president, Albert H. Henderson. Then he saw a story in a Boston paper claiming he was in a conspiracy with fellow White Stockings Flint and George Gore to grab higher salaries from management, which Corcoran denied. The story said Chicago would do just fine without Corcoran, prompting him to sign with Henderson. “For four years I have fulfilled my contracts to the letter and have worked hard and faithfully for the Chicago Club, but as my contracts never spoke of a reserve-rule or made any mention of one, I do not feel I am breaking my word in any way to that club. … Leaving the public to judge my action, I am, respectfully, Lawrence J. Corcoran.”39 Henderson’s contract to Corcoran was said to be $3,000. The White Stockings had a forgettable 1884 season. They were 5-14 on May 26. Injuries contributed to the slow start. “A nine composed about one-third of ‘has-been’ material will not win the championship this year,” whined the Tribune.42 Chicago never spent a day in first place, finishing 62-50 in fourth-place, 21½ games behind. Corcoran won only two of his first 12 starts before pitching a one-hitter on May 23. On June 16, with Goldsmith in Canada, Corcoran, suffering a sore pitching hand, alternated his left and right hands in a desperate attempt to pitch a game in Buffalo. The Buffalo Commercial Advertiser said Corcoran had a “felon” on his right index finger and had “no business in the box. Why in the name of common sense Anson permitted Goldsmith to go to Canada and persisted in playing Corcoran, when the little man was suffering excruciating pain, is a question no one can answer. It was an act at once brutal and stupid. Larry used his right and left hands alternately, but it was no go.”43 He was removed after four innings. Corcoran came back to throw a no-hitter against Providence on June 27. “The fact that Chicago has at least one pitcher was demonstrated very plainly in yesterday’s game,” wrote the Tribune, “in which the Providence team, composed of the heaviest batters in the league, failed to earn a single base in nine innings.”44 It was Corcoran’s third no-hitter and a 6-0 victory. Corcoran was the first pitcher to throw three no-hitters.45 Corcoran also pitched shutouts on July 1 and 7. “The Chicagos, thinking they could win with any pitcher, presented a brother of Larry Corcoran’s and the home team made him think he had better sign with amateurs,” wrote the Inter Ocean on July 16 after the White Stockings lost to Detroit, 14-0, the day before.46 Corcoran’s older brother, Mike, made his debut against Detroit and pitched a complete game giving up 16 hits, seven walks, five wild pitches, and 14 earned runs. It was Mike Corcoran’s only major-league appearance. Corcoran died on October 14, 1891, at the age of 32 at his home at 24 Cherry Street in Newark after suffering for several months from Bright’s disease, a kidney ailment that today is called nephritis. His funeral was held at St. John’s Catholic Church in Newark. He was survived by Gertrude and four children, Margarete, Walter, Mary, and Sarah Corcoran. This biography appears in SABR's "No-Hitters" (2017), edited by Bill Nowlin. In addition to the sources cited in the text, the author consulted John O’Malley’s article, “Lawrence J. Corcoran,” in Robert L. Tiemann and Joseph Overfield, eds., Nineteenth Century Stars (Phoenix: Society for American Baseball Research, 2012), 63-64. Special thanks also to the Baseball Hall of Fame in Cooperstown, New York, for access to Larry Corcoran’s file, and Jacob Pomrenke for research assistance in writing this article. 1 “Between the Lines,” Boston Herald, November 15, 1891: 22. 2 “Special to the Eagle,” Brooklyn Eagle, April 2, 1897: 4; Peter Morris, Game of Inches: The Story Behind the Innovations That Shaped Baseball (Chicago: Ivan R. Dee Publishers, 2010), 93. 3 “Enterprise vs. Chelsea,” New York Clipper, May 19, 1877: 59. 4 “Base Ball,” Brooklyn Eagle, May 4, 1877: 2. 5 “Livingston vs. Rochester,” New York Clipper, June 30, 1877: 107. 6 “The Springfields for 1879. Something About the Previous Work of the Men Constituting the Nine,” Springfield (Massachusetts) Republican, April 11, 1879: 8. 7 SABR researcher Joseph M. Overfield called the 1878 Bisons “The First Great Minor League Club.” See http://research.sabr.org/journals/first-great-minor-league-club. Retrieved July 28, 2015. 9 “Sporting Matters. Base Ball,” Springfield Republican, May 14, 1879: 5. 10 “Sporting Matters. Base Ball. Exit Springfield Ball Club,” Springfield Republican, September 8, 1879: 5; “Sporting Matters,” Springfield Republican, September 24, 1879: 5. 11 “Sporting Matters. Rowell Wins the Walking Match, with Merritt Second and Hazael Third,” Springfield Republican, September 29, 1879: 5. 12 David L. Fleitz, Cap Anson: The Grand Old Man of Baseball (Jefferson, North Carolina: McFarland, 2005), 88. 13 Adrian C. Anson, A Ball Player’s Career. Being the Personal Experiences and Reminiscences of Adrian C. Anson (Chicago: Era Pub, 1900), 109-110. 15 “Sporting. Base Ball,” Chicago Tribune, April 2, 1880: 3. 16 “Base-Ball. Opening of the League Championship Season Yesterday,” Chicago Tribune, May 2, 1880: 7. 17 David Quentin Voigt, American Baseball: From Gentleman’s Sport to the Commissioner System (Norman, Oklahoma: University of Oklahoma Press, 1966), 102. 18 “Sporting Events. The Most Extraordinary League Championship Game on Record,” Chicago Tribune, June 5, 1880: 11. 19 “Athletic Amusements. Model Exhibitions on the Base Ball Diamond Yesterday,” Boston Globe, August 5, 1880: 4. 20 “Sporting Events. The League Championship Struggle Resumed on the Chicago Grounds,” Chicago Tribune, August 11, 1880: 3. 21 “Sporting Events. A Game of Ball In Which Boston Scored Neither a Run Nor a Base-Hit,”Chicago Tribune, August 20, 1880: 8. 22 “Sporting Events. Slashing Defeat of the Clevelands by the Chicago Champions,” Chicago Tribune, May 4, 1881: 5; “Sporting Events. Providence Smothered by the Chicago Champions — Score, 8 to 0,” Chicago Tribune, June 25, 1881: 6. 23 “Sporting Events. A Model Game of Base-Ball in Which the Chicagos Were Victorious,” Chicago Tribune, August 5, 1881: 3. 24 “Wild Play and ‘Snake’ Balls,” Inter Ocean (Chicago), August 12, 1881; Morris, 97. 25 “Sporting Events. Chicago Successful in a Twelve-Inning Game Against Detroit,” Chicago Tribune, August 24, 1881: 3. 26 “Base-Ball Games. Return of the Chicago Team for a Series on Their Own Grounds,” Chicago Tribune, June 21, 1882: 8. 27 John O’Malley, “Lawrence J. Corcoran,” in Mark Rucker and Robert L. Tiemann, eds., Nineteenth Century Stars (Kansas City: Society for American Baseball Research, 1989), 31. 28 “Corcoran Was Off Being Married,” Cincinnati Enquirer, August 24, 1882: 5. 29 “Base Ball Matters,” Boston Herald, August 29, 1882: 5. 30 An obituary listing “Gertrude A. Corcoran nee Grork, widow of Lawrence J. Corcoran” as having died on March 9, 1898, appeared in the Springfield Republican, March 12, 1898. 31 “Base-Ball Games. Brilliant Close of the Championship Season by the Chicagos at Home,” Chicago Tribune, September 21, 1882: 8. 32 “Sporting. Chicago vs. Boston,” Chicago Tribune, May 23, 1883: 6. 33“Base-Ball. Chicago 9; Boston 0,” Chicago Tribune, July 19, 1883: 8; “Base-Ball. The Cleveland Club Neatly Whitewashed By the Home Team,” Chicago Tribune, August 30, 1883: 2. 34 “Sporting. The Chicago Team Now Clearly in the Lead for the Championship,” Chicago Tribune, September 9, 1883: 3. 35 “Base-Ball. The Champions Defeated in a Close and Exciting Game at Boston,” Chicago Tribune, September 11, 1883: 6. 36 “Placing the Ball,” Chicago Tribune, September 9, 1883: 3; Morris, Game of Inches, 45. 37 “Base Ball. Corcoran Knocked Out,” Inter Ocean (Chicago), December 9, 1883: 19. 38 “To Be Expelled From the League,” New York Times, December 15, 1883: 4. 39 “Corcoran and the Chicago Club,” New York Clipper, December 15, 1883: 647. 40 New York Clipper, January 12, 1884: 727; “At His Old Post,” Wheeling (West Virginia) Register, January 8, 1884: 1. 41 “Baseball. A Game on Skates,” New York Clipper, January 19, 1884: 745. 42 “Sporting News. The Chicago League Team Again Defeated — Providence the Victor,” Chicago Tribune, May 11, 1884: 11. 43 Buffalo Commercial Advertiser, June 17, 1884; cited in Al Kermisch, “Corcoran Pitched With Both Hands in Regular Game,” in Baseball Research Journal #10 (SABR, 1982), 66. 44 “Base-Ball. Chicago, 6; Providence, 0,” Chicago Tribune, June 28, 1884: 6. 45 The feat was tied twice (Cy Young in 1908 and Bob Feller in 1951) and broken in 1965 by Sandy Koufax. 46 “Base Ball. League Club Contests,” Inter Ocean (Chicago), July 16, 1884: 8. 47 “Base-Ball. The Chicago Program for 1885,” Chicago Tribune, October 12, 1884: 15. 48 “All in Sport. The Chicagos Win an Uphill Game From the Willow-Wielders of the Hub,” Chicago Tribune, May 27, 1885: 3. 49 “Sporting Affairs. Anson’s Team in the Lead in the League Championship Race — Corcoran’s Condition,” Chicago Tribune, June 22, 1885: 3. 50 “Diamond Dust,” Inter Ocean (Chicago), July 12, 1885: 3. 51 Henry Clay Palmer [Remlap], “From Chicago. Our Interest in the Game — Al Spalding and the Chicago Club — Larry Corcoran’s Release,” Sporting Life, July 29, 1885: 4. 52 “Corcoran Signs With New York. His Sore Arm Suddenly Healed,” Inter Ocean (Chicago), July 19, 1885: 2. 53 “Baseball News,” New York Times, July 20, 1885: 5. 54 “Baseball. The New-York Team Win a Second Victory in St. Louis,” New York Times, October 9, 1885: 5. 55 “Transfer of a Player,” New York Times, June 29, 1886: 2. 56 “Out-Door Sports. Base Ball,” Washington Daily Critic, July 7, 1886: 1. 57 “Base Ball Briefs,” Kansas City Times, August 7, 1886: 6; “Baseball. Remarkable Pitching Performances in 1886,” New York Clipper, January 29, 1887: 729. 58 “Larry Corcoran Signs With Nashville,” New Orleans Times-Picayune, March 23, 1887: 2. 59 “Around the Bases,” Chicago Tribune, May 6, 1877: 3; New York Sun, May 8, 1887: 14; “Tennessee Troubles,” New Orleans Times-Picayune, May 3, 1887: 2. 60 “A Change Pitcher. Larry Corcoran Engaged,” Indianapolis News, May 10, 1887: 1. 61 “Base-Ball. A Long Game Between Chicago and Indianapolis,” Chicago Tribune, May 12, 1887: 3. 62 “Corcoran’s Trial. Kindly Received by Chicago,” Indianapolis News, May 12, 1887: 1. 63 “Oh, What a Game! The Lamented Corcoran Knocked out of the Box — General Ball Talk,” Indianapolis News, May 18, 1887: 1. 64 “Ball Gossip,” Indianapolis News, May 20, 1887: 1. 65 “Base Ball Gossip,” Indianapolis News, May 23, 1887: 1. 66 “Baseball Small-Talk,” The Critic, June 7, 1888: 3; “Chips From the Diamond,” New York Sun, August 6, 1888: 3. 67 “Notes and Comments,” Sporting Life, December 19, 1888: 2. 68 “Notes and Gossip,” Sporting Life, June 21, 1890: 4; “News, Gossip, and Comment,” Sporting Life, June 27, 1891. 69 “Still on Earth,” Sporting Life, December 12, 1891: 12. 70 Tom Meagher, “Essex County police, firefighters raise money to mark grave of forgotten baseball player,” http://nj.com/news/local/index.ssf/2009/09/cops_raise_money_to_mark_grav..., retrieved August 1, 2015.